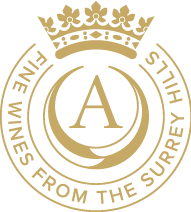 We are delighted to announce the launch of a new wine region, 'Vineyards of the Surrey Hills'. Our new collaboration has been created to celebrate the excellence of wines grown in this unique area of outstanding beauty. Together with our friends at Denbies Wine Estate, Greyfriars Vineyard, High Clandon, and Chilworth Manor Vineyard, we are proud to be putting Surrey on the map as a premium wine region, offering visitors to the Surrey Hills outstanding wines, beautiful views and a warm welcome. Nurtured on the chalky limestone hills with the same geology as that of the Champagne region, our vineyards represent the very pinnacle of quality in the increasingly-successful English wine industry, having won top international awards for our wines and wine tourism. Join us in celebrating our official launch with a weekend of festivities across all five vineyards on the 8th-9th June 2019.